The AC joint is located at the top and anterior portion (front) of the shoulder and is the junction between the acromion process of the scapula and the lateral end of the clavicle. The joint is held together by three strong ligaments and possesses cartilage that covers the ends of both bones. 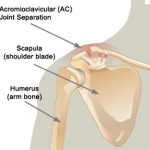 An injury to the AC joint can result in a sprain of these ligaments or a shoulder separation. Shoulder separations occur on a spectrum ranging from a sprain or partial tear (Grade I) of the ligaments, to complete tearing of all major ligaments that support the joint (Grade IV). Grade III: Tear of AC ligament and CC ligament. >5mm elevation of lateral clavicle. Grade IV: Tear of AC ligament and CC ligament. Elevation and Posterior displacement of clavicle into trapezius muscle. The most common cause for a separated shoulder is a fall directly onto the lateral aspect of the shoulder. Symptoms of an injured AC joint range from tenderness and mild swelling, to severe pain and a prominent visual bump protruding from the top of the shoulder. Treatment for lower grade AC joint injuries usually consists of rest, ice and the use of a sling to support the joint and prevent the shoulder from "hanging". For more severe injuries, shoulder instability and susceptibility to future separations and dislocations is a serious concern. Numerous surgical techniques are available to repair and stabilize the joint. Minimally invasive arthroscopic surgery is often used to return the joint to its proper position, repairing any damaged structures and re-establish a full range of motion.